Anna Madden Living: Shopping in the grocery store with a stroller? I have a question for you moms and dads or anyone else: Have you ever gone into the grocery store with a stroller because your toddler is sleeping? Did you put the groceries in the basket of your stroller? I've done this many times and I felt fine about it. 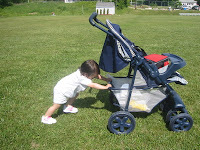 But Angus (my husband) said it's not a good idea, because I shouldn't put stuff in my stroller that I haven't paid for. I was shocked to hear that. What should I do? Go home and wait until my daughter wakes up and then go back to the store? Aaahh ... it's so annoying. I don't have time to do that!